Another hot and steamy day in New York City but as yet no rain. After our normal breakfast routine in Bryant Park we headed to the High Line. 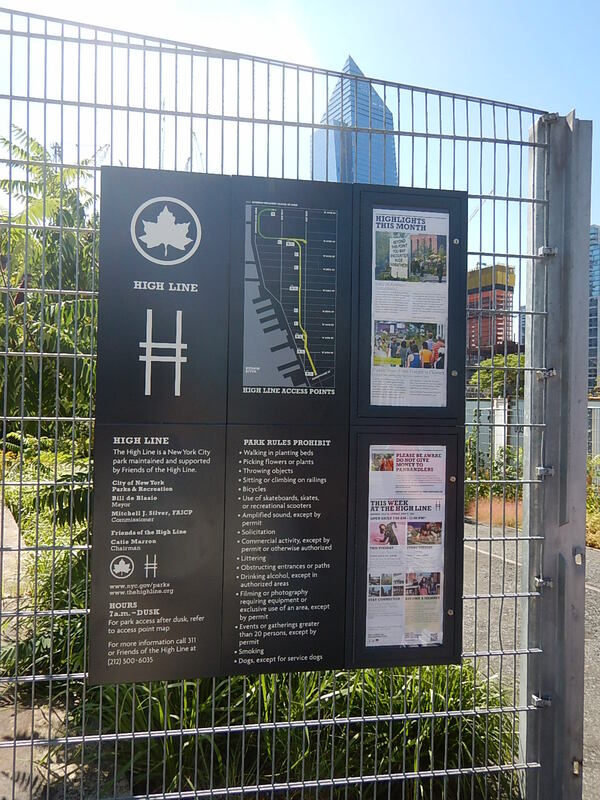 What a great project this is, taking a 1.5 mile stretch of a disused elevated railway track on the Lower West Side and making it into a park. We didn’t know quite what to expect but it was fantastic, a green road through the city with views across the Hudson River. The plants and trees were great to see but the civil engineering that has been undertaken is fantastic. Design of benches, tables, etc. make a real statement and some fantastic planting ideas bring nature into the city, for instance one section used a planting level well below the walkway on the old rail-line which means visitors can walk through the canopy of the trees; see some of the images we took. On a hot day it was easy to understand what an oasis the High Line Park offers local residents. It was at the end of the High Line than Kim managed to buy the replacement hat, which in these conditions is needed. After we finished in the Park we walked into mid-town and caught the subway up to Macy’s. We had a good look around and thought it was time to eat. We found a salad bar and had a great meal and great value too! We sat opposite a nice Australian couple who are on a road trip of their own around the USA. They talked to us about our itinerary and theirs and about life in general, it was a really nice few minutes; we even discussed the rugby and the cricket, briefly! We then walked back to the hotel along 6th Avenue. In the evening we went out to find the nearby Pizza place that had been recommended, unfortunately it was closed for a one off event so we walked the other way and found a real New York diner. Back at the hotel we watched some of the Democrat convention including Barak Obama’s speech; he was really impressive. How can a country that has elected Obama twice even consider electing Trump?! Next morning, we had to pack up for our move to Chicago, we checked out of the hotel and left our bags in their store room. We headed outside into a very hot and humid city, had our normal breakfast and then headed for the New York Public Library to have a look around. What a great space! We found a little cinema and saw a 25-minute presentation on the history of the Library. We actually watched it twice, nothing to-do with the comfy seats and fantastic air condition of course! Watching the film, we discovered that our breakfast spot in Bryant Park is above a massive book depository holding 4.5 million books for the library. We also saw a copy of the Guttenberg Bible which is on display and an exhibition called Alexander Hamilton: Striver, Statesman, Scoundrel (Hamilton was a Founding Father of America and died in a duel). All too quickly it was time to collect our bags and head to Penn Station to catch the train west. So what did we learn from our time in NYC? 1. It’s very hot in July! 2. If you want to walk N or S in lower Manhattan use Broadway as it runs diagonally and makes the blocks are shorter. 3. The restoration of the High Line is a must see, as is Ground Zero. 4. You can get a good cheap meal in Macy’s. The Hotel Mela was a good hotel in a fantastic location, near Times Square but far enough away from the madness. The room was good with free super-fast Wi-Fi and the staff were very helpful.